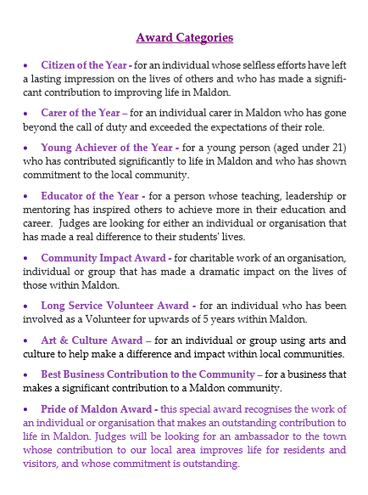 The Mayor of Maldon, Councillor Jeanette Stilts is pleased to announce that nominations are now being sought for the Pride of Maldon Awards 2019. Nominate a person of any age who you think deserves an Award, perhaps for a single act of kindness, a long-lasting battle against the odds, or for their inspirational community work. The deadline for nominations is 25th February 2019. 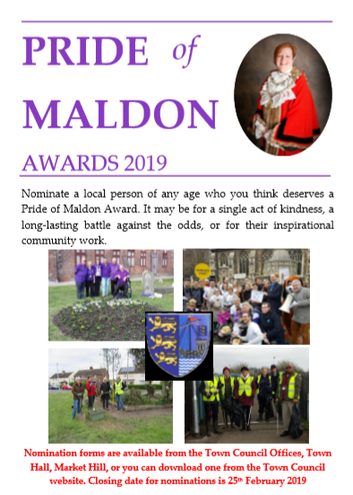 Nomination forms are available on the town council’s website www.maldontowncouncil.gov.uk, or by phoning the Town Hall 01621 857383.